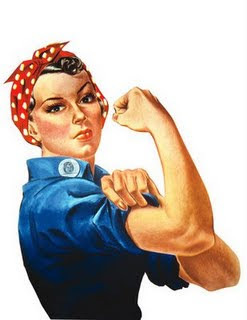 Rosie's Riveters is a weekly posting written by Booklust readers about riveting females in literature. Many readers have strong reactions to the women in the books they read- either very positive or very negative. These are the characters we find riveting, for good reasons or bad ones, and they form the population of Rosie's Riveters. Through this weekly post, we can discuss females we love to hate, or love to love. And maybe, just maybe- we can determine why we react so strongly to them. If you are interested in participating, please comment on this post, e-mail me, or just fill out the template below and send it to me. I am always looking for more participants! This week's poster is Luanne from A Bookworm's World. Luanne and I met through BBAW. We were matched as interview partners and she very kindly put up with all the delays and scatterbrained emails on my end as I was trying (and failing!) to participate in BBAW while in India. It was really fun to meet Luanne as she reads very different books than I do, and thus interacts with really different book bloggers than I do. It's really interesting to see how vast the internet is, and how people make their own little pockets within it. I am really happy to have met Luanne through BBAW and to have been introduced to her blog. What book does she feature in? 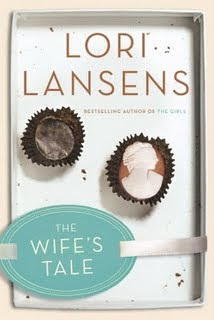 My favourite author is Canadian Lori Lansens. Mary is the lead character in her latest book - The Wife's Tale. Do you love her or hate her? Oh I absolutely love her. Describe her personality- how would you describe her to a friend? Mary's personality changes as she grows throughout the book. She is shy and reclusive when we meet her. But when circumstances force her into the world, she reluctantly steps out. She is unaware of the person she is becoming - kind and true ands steadfast. She finally becomes accepting of herself. Can you compare her to a celebrity? No - it would be an injustice to the character of Mary. Her strength. This is the hallmark of Lansen's characters. I am moved to tears by both Mary and another Lansen character I'll save for my next Riveter post. Mary is at the absolute bottom of the well. Her determination to do things she's never done, to go places, to keep putting one foot in front of the other and move forward even though it's sometimes two steps forward and one step back. Her humanity. She is an object of scorn and ridicule by some, but she never wavers from her own core beliefs. What do you most admire/despise about her? Again, the obstacles she faces and overcomes. Her journey towards self discovery and her unflagging journey to get there. Would you recommend reading the book in which the Riveter features? Absolutely - but it's not coming out in the US until Feb 2010 - put it on your wishlist! Do you have a quote by or about your Riveter that you'd like to share? Mary remembered, when she was nine years old, stepping off the scale in Dr. Ruttle's office and hearing him whisper the word to her slight mother, Irma. It was an unfamiliar word, but one she understood in the context of the fairy-tale world. Obeast. There were witches and warlocks. So must there be ogres and obeasts. Little big Mary wasn't confused by the diagnosis. It made sense to her child's mind that her body had become an outward manifestation of the starving animal in her gut. I'll have to check this book out! I don't think I've read anything by this author. I really, really want to read this book, and am really glad that it features a riveting lead character. Great post! This sounds amazing! I am going to be getting this when it comes out! This is the first Rosie's Riveters post I've had the pleasure to read. What a fantastic idea! Thanks for your comment on my blog (Lou's Pages). I would love to do a Rosie's Riverters post at some point - right now I don't know about which character, but I will come back to you about that. Rosie's Riveters sounds like a great idea and I love it.